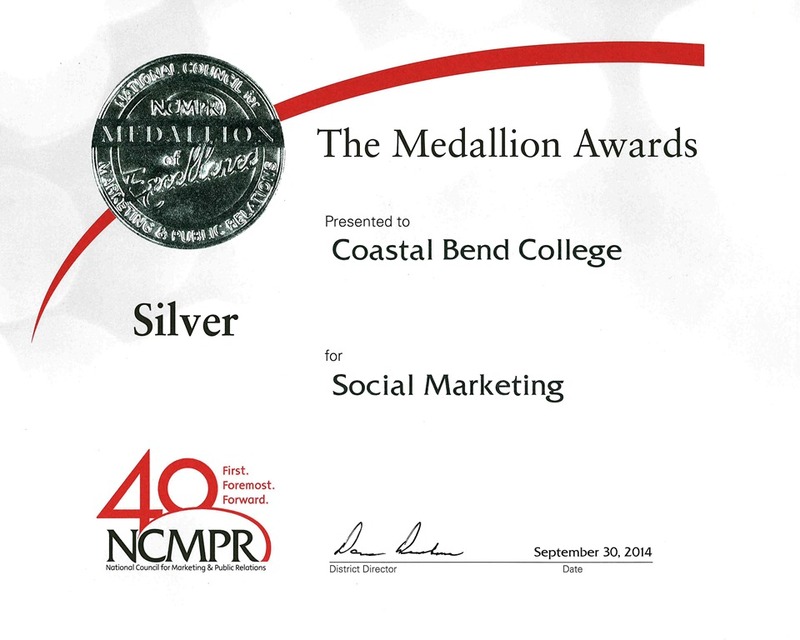 Coastal Bend College is excited to announce that its Marketing & Public Relations Office was awarded a silver Medallion Award in social marketing by the National Council for Marketing and Public Relations (NCMPR), District 4, which includes community colleges in Arkansas, Colorado, New Mexico, Oklahoma, Texas and Wyoming. The award was presented at the NCMPR District 4 Conference in Oklahoma City on September 30. The award winning social marketing (Facebook) campaign was for the college’s first ever Maymester held in May 2014. The campaign, which cost only $212.75, helped raise awareness of the course offerings and benefits of taking Maymester courses. Over 140 students enrolled in the Maymester, and the Facebook ad campaign garnered over 27,000 impressions during the 22 day campaign. “This award is particularly exciting for the college because it shows we are progressive and innovative when it comes to our marketing and advertising strategies. CBC loves to connect with our students and communities via social media, and we look forward to implementing more social marketing campaigns to spread the word about the great things happening here,” said Monica Cruz, director of marketing and public relations.